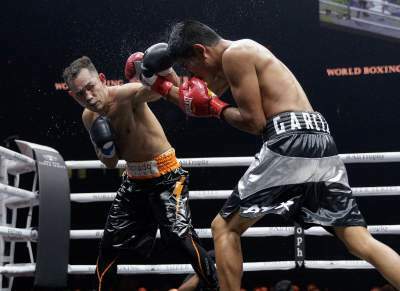 Donaire victorius in his comeback fight, wins WBC silver feather title against Hernandez - Balita Boss! Nonito "The Filipino Flash" Donaire (38-4, 24 KOs) is triumphant in his return in the ring at the Alamodome in San Antonio, Texas, on Sunday, September 24 (PH time) against Mexican Ruben Hernandez (22-3-1) in a ten-round unanimous decision. With the judges’ scores of 100-90, 97-93, 99-91, all in favor of Donaire, the 34 year-old boxing champ is announced as the WBC silver featherweight champion. I boxed very well which is something I haven’t done in a long time. I moved my legs well and maintained it throughout the whole fight,” he said. “I’ll go look at this fight and see what I should have done to improve. It’s great to get the victory and get a great learning experience under my belt,” added the four division champion. The fight is his first official fight under the banner of Richard Schaefer's Ringstar Sports after leaving Top Rank promotions in line with his loss against Jessie Magdaleno in November 2016 in Las Vegas for the WBO super bantamweight championship game.